Flat, low-lying, large irregular meadows, large dispersed hall and farm estates, parkland areas, stone bridges on major river crossings, with evidence of prehistoric and early medieval activity. Falling along the eastern edge of the medieval ecclesiastical parishes of Henllan and Llanfarchell, and part of the northern tip of the parish of Llanrhaeadr-yng-nghinmeirch. Administratively, the area fell within the commotes of Is Aled and Ceinmerich, part of the ancient cantref of Rhufoniog. During the late glacial period the area was covered by a remnant glacial lake, termed 'Llyn Clwyd' which formed by ponding of water behind moraines across the vale. Boreholes have shown that there are up to 10m of silty alluvium, fine gravel and organic deposits in the central part of the vale at this point, and suggest that the later history of the lake was characterized by marshy conditions and flash floods. It is uncertain when the lake ceased to exist, but it is possible that evidence of Mesolithic activity discovered during archaeological excavations at Tandderwen, just to the east of Kilford Farm, may represent season activity on the fringes of a marsh during a late stage in the infilling of the lake in about the 5th millennium BC. Evidence of activity in the later prehistoric and early historic periods is represented by the early Bronze Age and early medieval cemeteries excavated at Tandderwen. These sites were first identified by aerial photography and as yet no direct evidence of settlement or land-use during these periods in the area has been established. Excavation has shown that these sites are very vulnerable to erosion by deep ploughing and pan busting (Brassil et al. 1991). Generally flat, low-lying, seasonally waterlogged and flooded meadow land on the western floodplain of the Afon Clwyd and at the confluence of the Afon Clwyd and Afon Ystrad, to the west of Denbigh, between about 25-40m OD. Embanked watercourses to prevent flooding. Settlement is almost exclusively limited to Lleweni Hall and Kilford Farm and their associated estates. Lleweni Hall, once the seat of the Salusburys, was an important late medieval hall with a hammerbeam roof, enlarged during the 17th and 18th centuries, but was almost entirely demolished in 1816-18, though parts of the later 18th-century brick-built hall survive. There are important dilapidated brick outbuildings at Lleweni Farm, including 18th-century hay barn and large and impressive stables and carriage yard. Farm and hall approached by causeways from Kilford on the south, bounded by mature multi-species hedges, and via a causeway and small stone bridge across the Afon Clwyd from the east. 19th-century brick farmhouse and delipated stone and brick outbuildings at Kilford Farm. One of the barns has three reused hammerbeam trusses. Towards the end of the 18th century Lleweni was described as follows by Thomas Pennant, then owned by Sir Thomas Fitzmaurice, who has recently established the elaborate bleach works (see Aberchwiler). Lleweni, notwithstanding it lies on a flat, has most pleasing views of the mountains on each side of the vale: the town and castle of Denbigh form most capital objects, as a distance of two miles: and the nearer environs of the place animate the country by the commercial spirit of their active master (Pennant 1793). Large irregular meadows and occasional fodder crops with generally thick and mature multi-species hedges, including hawthorn, ash, alder, maple and hazel, with scattered larger alders and poplars, with some traditional hedge-laying, some of the larger fields being subdivided by post and wire. Some fields bounded by drainage ditches and dykes. The more poorly-drained and lower-lying fields crossed by networks of open drains. Taller alders, willows and poplars strung out along watercourses. Dilapidated 18th-century? brick wall along the boundary of the turnpike road along the northern boundary of the character area. Small scattered deciduous and coniferous woodland plantations with a larger area of deciduous woodland known as Big Wood to the west of Lleweni Hall, classed partly as ancient semi-natural woodland and ancient replanted woodland. 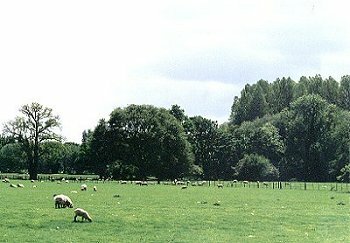 Area of parkland character around Lleweni Hall with some scattered mature oak and beech trees and to the north of Kilford Farm, partly walled. Modern air-strip across the northern side of the area. The area is crossed by several important routeways. The road between Denbigh and Bodfari runs along the northern side of the area, with bridges across the Clwyd and Nant Lleweni stream at Pontruffydd and Pont Ffriddmor. The southern part of the area is crossed by Denbigh to Llandyrnog road with late 19th- and 20th-century bridges across the Afon Ystrad and Afon Clwyd at Pont Parc-canol and Pont Glan-y-wern.